Of late, while driving on the highway, more and more cars fail to yield as they enter the highway from the on ramp. So intent to merge without yielding, one car ran me into the next lane which was, thankfully, empty. This trend results in bolder and bolder moves on the part of drivers entering the roadway, making it much more dangerous, as I experienced. This affects more than driving, though. As Christians, yielding ourselves to God in humility and obedience marks the way of authentic faith. Yet, some very popular faith principles such as the prosperity gospel sound more like making our own plans and offering them to God for him to bless. Jesus lived differently, always yielding only to what he received from God rather than his own will. If Jesus, the Son of God only did what his Father God showed him, how much more should we? During this Lenten season, spend time in prayer about your relationship with God. Are there areas in your life that you have not yielded to God? 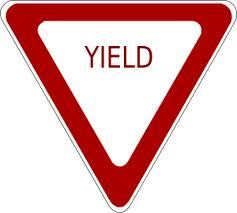 This entry was posted in Life and Faith and tagged Christian, driving, God, yield. Bookmark the permalink. Everyone has areas in their lives they wrestle with yielding. It is often progressive and cyclical involving several attempts to completely yield. I am often amazed at the number of parallel and similar accounts of this process in scripture. Jacob wrestling with God and Christ in the garden are two that I profoundly identify with. The fact that these illustrations still have relevance 2000+ years later proves for me that the scripture is of God.